Spider Egg is an alchemy reagent which was added in Update 10. 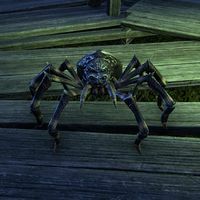 It is occasionally found by killing Spiders, including the smaller passive Spiders, Giant Spiders, Spiderkith and even Spider Daedra. This chart lists only combinations in which two or more of Spider Egg's effects are present. This page was last modified on 25 June 2018, at 21:27.